Language Log » Chinese words and characters for "gizzard"
Chinese words and characters for "gizzard"
Having immersed myself in Korean gizzard terminology for the past week, I now turn to Chinese gizzard terms, which are every bit as curious and varied, if not so intermittently scatalogical. Whereas the problems with Korean terms for gizzard centered primarily on their imprecision and vulgarity, the difficulties with Chinese terms for gizzard have more to do with pronunciation, topolectal variation, and the characters used for writing the various terms. I started out with one thing I knew for sure, and that was that my wife's family pronounced their word for "gizzard" as JIZHENGER, with all three syllables in first tone. Since I learned Mandarin primarily as a spoken language for the first three or four years, I didn't pay any attention to how that was written in characters, but I knew for sure that JIZHENGER meant "gizzard" (I watched my mother-in-law and my wife transform those humble giblets into delicious dishes, so I naturally heard them say what it was they were slicing up so carefully). They had other words for chicken livers (jīgān 鸡肝), hearts (jīxīn 鸡心), kidneys (jīshèn 鸡肾), and so forth. (One of the main reasons I married Li-ching was because of the incredibly delicious chicken hearts she made for me once when we were dating. She could also make chicken livers and even chicken kidneys taste good, though they required an extraordinary amount of care during preparation, especially the kidneys.) JIZHENGER meant "chicken gizzard", nothing more, nothing less. I was especially keen about this word JIZHENGER, first, because I liked the odd ring it had, and, second, because I loved to eat the gizzards the way they prepared them, whereas back home in Ohio the only thing we ever thought to do with gizzards was to dice them up together with all the other giblets for use in gravy and stuffing. I surveyed nearly three dozen lexicographers, dialecticians, and native speakers of various topolects from different parts of China, asking them how they would say "gizzard" in their version of Chinese. The largest group (about one quarter of the total), including speakers of Mandarin from Taiwan and the Mainland, said that their preferred term for "chicken gizzard" was simply jīzhēn 雞胗 (traditional) / 鸡胗 (simplified). Beyond that, the situation starts to get complicated. Another — somewhat smaller — group, also speakers of Mandarin from Taiwan and the Mainland, preferred jīzhūn 鸡肫. It's strange that a few individuals spoke jīzhēn but wrote 鸡肫. The latter seems a bit fancier than jīzhēn 鸡胗 and probably appears with greater frequency on menus than in speech. Some respondents told me that it is all right to pronounce jīzhūn 鸡肫 as jīzhēn. As an animal part, zhūn 肫 refers specifically to the gizzard of a fowl, though it can also have the completely different meaning of "honest; sincere". Pronounced chún, it can stand for an ancient term signifying the back portion of an animal used in sacrifice, "complete" or "entire", and "fine", "delicate". If you want to get really fancy with the way you write jīzhēn 鸡胗 ("chicken gizzard"), you can use 珍 for the the second syllable or go even several steps further and use one of the following characters: 珎 /鉁 / 錱. That last one 錱 is particularly interesting for its complexity and opaque phonology, and is sometimes seen in restaurant names. 珍, 珎, 鉁, and 錱 all mean "precious, valuable, rare". 珍 has the same phonophore as 胗, but those who want to make the lowly (ahem!) gizzard seem more elegant than it really is substitute a character having a jade semantophore for one with a flesh semantophore. 鉁 and 錱 add a gold semantophore into the mix — but a jīzhēn is still a chicken gizzard, no matter which characters you use to write the sounds. From looking at recipes for 雞珍 on the Web, one gets the impression that 雞珍 is just a fancy name for a dish made primarily from chicken gizzards (雞胗). For example, 雞珍 (not 雞胗, the usual way to write the word for "chicken gizzard") tends to be listed as one of the ingredients in some recipes for gizzards, and there is no mention of other parts of the bird. The pictures of the dish appear to match Google images for "chicken gizzard". For some examples of such recipes for gizzards written as 雞珍, see here, here, and here. Zhēn 珍 in cooking doesn't always refer to "gizzard" (in fact, in the majority of cases, it does not refer to gizzards, but rather to various types of finely prepared sea food, meat, mushrooms, vegetables, and even drinks; adding zhēn 珍 to the name of a dish is guaranteed to make it sound elegant and expensive). For example, we may speak of bāzhēn 八珍 ("eight treasures / dainties / delicacies"), and this is a usage that goes back around two thousand years. However, the fact that 胗 and 珍 share the same phonophore invites the slippery equation of jīzhēn 鸡胗 with jīzhēn 鸡珍, which sticklers would say is misleading, if not downright wrong. Note that all of these recipes use the standard character form for zhēn, viz., 胗, not 珍. While we're talking about character substitution, then we must face the fact that 胗, in classical times, didn't mean "gizzard" at all, but was equal to zhěn 疹 (N.B. same phonophore in third tone instead of first and with sickness radical rather than flesh radical) and meant "fever blisters on lips", "ulcerated lips", then "pustules", "rash", "measles". 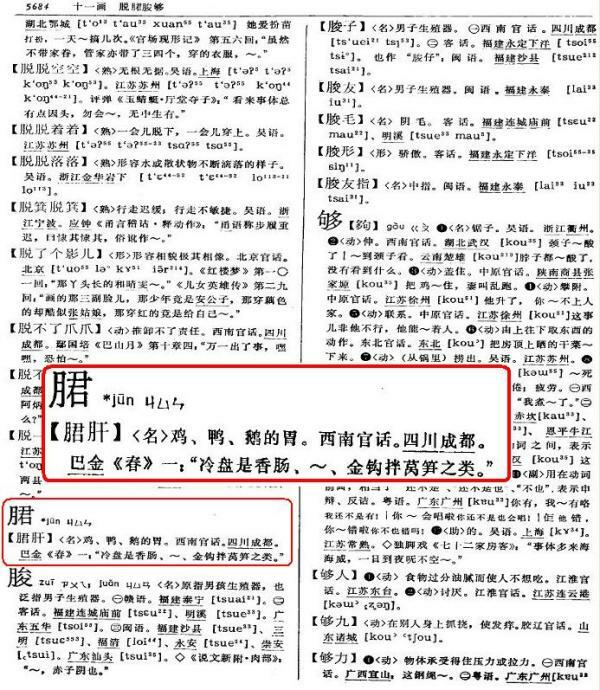 The majority of Mandarin speakers who preferred jizhen for "gizzard" used the first tone for both syllables, while a few said that they and their friends used the first tone on the first syllable but the third tone on the second syllable, and volunteered that, although they were aware that 1-1 were the "correct" tones, they always used 1-3 tonal distribution, though they didn't know why. Some individuals who were influenced by Pekingese or other northern topolects added retroflection, hence jīzhēnr 雞胗兒 (鸡胗儿 in simplified). Others, even in Beijing, say jīzhēnzi 鸡胗子. Both -r 兒 and -zi 子 are noun suffixes, though they are often joined to terms that are already nouns. Sometimes they add a diminutive flavor. Often the -r 兒 is there mainly to add retroflection. This leads to the origins of my own pronunciation of the Mandarin word for "gizzard", namely, jīzhēngēr. I have always viewed that as a colloquial term and didn't really care how it was written in characters. In fact, I all along had my suspicions, as I do for many Chinese colloquial terms, that there is no necessarily "correct" way to write it with characters. Most people believe that the jīzhēn part should be written 鸡胗 and that the -gēr part of the word probably derives from -gān + -r –> -gānr –> gēr. Of course, the -r comes from the ubiquitous northern retroflex ending, but where does the -gān come from? Here are suggestions from informants who responded to my query about how to say "gizzard" in Chinese: 干, 乾, 肝. I'm a little dubious about each one of these, since the first is probably just a simplified way of writing the second, which means "dry" (would that make sense? — "chicken-gizzard-dry" — when you're talking about something that isn't dry), while the third means "liver" (would that make sense? — "chicken-gizzard-liver" — when you're talking about the gizzard, not the gizzard and the liver), unless jīzhēngēr originally meant "gizzard and liver", perhaps standing for "giblets" in general, and then that got narrowed down to just "gizzard" (I'm certain that my mother-in-law and wife and their relatives and close friends meant "gizzard" by jīzhēngēr, not giblets in general). A couple of informants (Taiwan Mandarin and mainland outside of Beijing) stated that they say jīzhēngān 雞胗肝/干 (without retroflex -r) for gizzard. A speaker of Jiang-Huai Mandarin told me that, in her topolect, the word for "gizzard" is pronounced as "jijun", but she had no idea what character should be used to write the second syllable. Another source for Jiang-Huai Mandarin gives kɥən tsɪ 肫子 (Mandarin zhūnzi) as the word for "gizzard" (Hanyu fangyan da cidian, 3.3511a). In southwest Mandarin (Guizhou), we have jīzhēnbāo 鸡胗包 ("gizzard"). In one part of Hunan, people call it "jikun", but my informant didn't know how to write that in characters and didn't specify tones. Other words for "giblets" are jīzá 雞雜 (which purely by accident sounds a bit like "gizzard", but literally means "chicken-miscellaneous", sometimes also with retroflection), jīshí 雞什 ("chicken-items"), and shíjiàn 什件 ("assorted / miscellaneous-items"), but these are not specific indicators of gizzards. Mutatis mutandis, the terms we've been discussing for chicken gizzards and giblets may be applied to duck and goose as well. Sometimes people confuse the crop / craw / ingluvies with the gizzard, but they are at opposite ends of the g-i tract and their functions are quite different, so I won't get into different terms for chicken crops. (Incidentally, a colorful expression used by my mother was "stick in your craw".) If you read Chinese and want to see how people mix up the various parts of the chicken's g-i tract, read these discussions that may be found on the web (here and here). There is also jīnèijīn 鸡内金 (lit., "gold inside the chicken", because it is yellow), which is popularly (at least in Jiangsu and some Wu topolects) known as jīzhēnpí 鸡胗皮 (lit., the "'skin' of the gizzard"; the actual pronunciation would be different in the various topolects) or "membranes of chicken gizzards" (ABC). In traditional Chinese medicine, the function of jīnèijīn 鸡内金 is to facilitate digestion, especially for children. Time now to turn to non-Mandarin terms for "gizzard". One Taiwanese informant tells me that the word for "gizzard" in his language is pronounced as "ke-kiān" but didn't indicate how to write that in characters. Another states that 雞胗 is pronounced as koe chín in Taiwanese, but that some Taiwanese also say koe kiān, which they write in characters as 雞腱. In Taiwanese, the chicken gizzard membrane is called koi33 kieŋ33 i24 鸡胗衣 (cf. Hanyu fangyan da cidian, 2.3030b). In Shanghai, at least nowadays, the locals seem to pronounce the word for gizzard as jì-dzen. Cantonese is really interesting. In the colloquial language, the word 腎 ("kidney", Cantonese Pronunciation san2) is used as a “loanword” to denote gizzard. When I asked how then to make the semantic distinction between "kidney" and "gizzard", I was told that this is done by using different tones, i.e., by changing the tone on san5 腎: gai1 san5/2 雞腎 ("chicken gizzard"). but san5 or (colloquial) san6 腎 ("kidney"). There are many other niceties regarding Cantonese terms for gizzards and the other giblets, but I'll pass over them here. Google Translate translates jīzhēn 雞珍 ("chicken gizzard") as "Chicken Jane"! Cf. the Chinese transcription of "Jane Austen": Zhēn Àosītīng 珍·奥斯汀 (there are various other character transcriptions as well). This very useful website illustrates scores of dishes / recipes related to chicken gizzards. It's noteworthy that, although the whole website, consisting of 7 pages with 21 different dishes on each page except the last one, is labeled as jīzhēn 雞珍, the character for zhēn ("gizzard") in the caption for each dish is variously written as zhēn 胗, zhēn 珍, or zhūn 肫. No matter how complicated the terminology for chicken gizzards is, we may conclude this little inquiry with the words of one informant: "Chicken gizzards are a bizarre yet delicious food. They require a lot of cleaning and very subtle timing in cooking. Thus, they are not easy to prepare. Anyway, we Chinese like them just as they are." Too bad you grew up in Ohio rather than Michigan, otherwise you might have visited this place. Maidhc, on that page you linked to, I guess "burger bonaza" is a typo? Gizzards were popular among East European Jews, and the Yiddish word for gizzard is the same as that for navel: pipik or pupik, depending on dialect. Great article! I learned not only a new character (肫), but also a new English word (gizzard) and one in Swedish (muskelmage). after having looked up the English word "gizzard". I have never before in my life heard about this organ but I'm not surprised to learn that the Chinese eat organs I didn't know existed. The last sentence of your comment gave me a great BELLY laugh. And I love the Swedish word "muskelmage" that you introduced us to: "muscle-stomach" — that's so appropriate for the gizzard! @Richard W., while their menu includes plain ol' burgers, if you drill down through their website you will see that their specialty is in fact deep-fried gizzards. I got a chuckle out of their home page, where they ask visitors to "CHOOSE YOUR LOCATION" just after claiming in equally bold font that this is the only "Gizzard City in the world!" @ Neil Dolinger: I was referring to the word "bonaza" (sic) rather than "burger". If I remember correctly your wife's family is from Sichuan. Which clearly only refers to: '月+君'肝. 成都话 dictionary has it listed as: '月+君'肝儿 / 肫肝儿 – but I have never seen it written "肫肝儿" in Sichuan. The '月+君' character can be typed out as: unicode: E621 with SunmanPUA (ttf). jsyk.